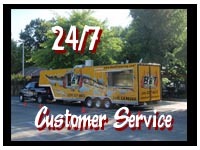 B & T Catering - "The Mobile Kitchen That Cooks for You!" At B&T Catering, we are all about making it easy for you! We'll come by in our big ol' trailer and prepare a delicious meal using only the freshest ingredients, without the need for a kitchen! Whether it's for your wedding, parties or corporate events, we are commited to making each event unique, leaving your guests impressed and keeping you assured that every detail is taken care of.